Spa Valley Railway » Visitor Information » What to see and do? 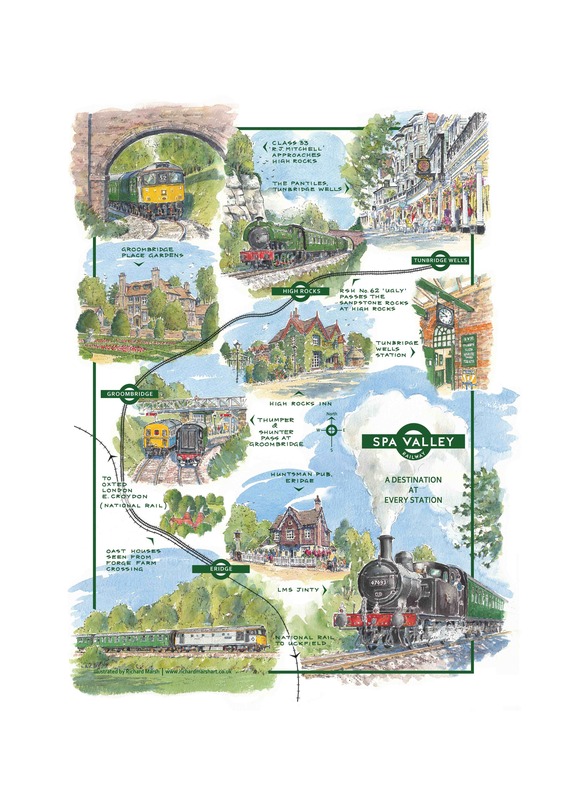 Welcome to the Spa Valley Railway, our slogan of "A DESTINATION AT EVERY STATION!" is certainly one that we are proud of as at every station we are very lucky to have attractions you can enjoy when you visit us! Travel by mainline trains operated by Southern Railway to Eridge where you can commence your journey through the wonderful High Weald Countryside and experience all the attractions we have to offer. The delightful country junction station, now a shadow of its former glory, once upon a time served stations such as Eastbourne, Lewes, East Grinstead and Three Bridges however following the Beeching Axe in the 1960s is now just a through station serving locations such as Uckfield, Crowborough and Oxted. Platforms 2 & 3 are now served by our trains into the High Weald and many hours of voluntary labour have gone in to restoring the station to its British Railways Southern 1960's Green & Cream colour scheme. At Eridge we have access to some vast and delightful walks through the woods towards Harrison's Rocks, Forge Farm and Groombridge. Also at Eridge there is the popular Huntsman Public House which serves local seasonal food, fine wine, great beer, and as they say themselves they are the best kept secret in Eridge! Our principle intermediate station, alight here to visit Groombridge Place Gardens & Enchanted Forest and also the delightful village divided between Kent & Sussex. Our station is newly constructed as the original station was demolished to make way for a new housing development in the 1990s, what you see today is the work of truly dedicated volunteers who have spent thousands of hours developing Groombridge into the wonderful station that we have today. Please do visit the restored Old Station Building which is now used jointly by ourselves as a Ticket Office and also the home of our Admin team plus Withyham Parish Council. Known as one of the sunniest spots on the railway and also the crossing point for trains, you can enjoy a snack or drink whilst savouring in the past at our country station. Discover the beautiful award-winning gardens and the forest with its giant swings, zip wires and Crusoe’s World and get there by Steam or Heritage Diesel train! The smallest however probably the most picturesque station on our line, built from scratch and opened in 1998 following the closure of the original halt in the 50s, serves the fantastic High Rocks themselves and the delightful Inn. High Rocks Halt is actually set in the gardens of the High Rocks Inn. This is an ideal place to sit and watch the trains go by whilst enjoying a drink in the landscaped gardens. A very unique station in a beautiful location, one stop on your journey you must make! These date back millions of years, acres of breath taking sandstone rocks are linked with eleven bridges. You can also enjoy the High Rocks Inn and function complex, plus access to the High Weald countryside and woodland footpaths. Since 1606 visitors have been coming to Royal Tunbridge Wells to experience the Chalbeayte Spring. Its chance discovery by Lord North, who was returning to London after a three month stay in the county, lead to the growth of Royal Tunbridge Wells and also the famous Pantiles. The news of Lord Norths discovery soon spread around and in 1629 the first royal visitor to the town became Queen Henrietta Maria, wife of King Charles 1, who stayed in the Wells for six weeks. In 1909 King Edward VII officially recognised the popularity of the town with its many royal visitors, which included his mother, Queen Victoria, and granted the town its "Royal” prefix. Today the town is still full of elegance and its original charm and the Spa Valley Railway takes you right to its Western edge, just a few minutes walk from the Pantiles.